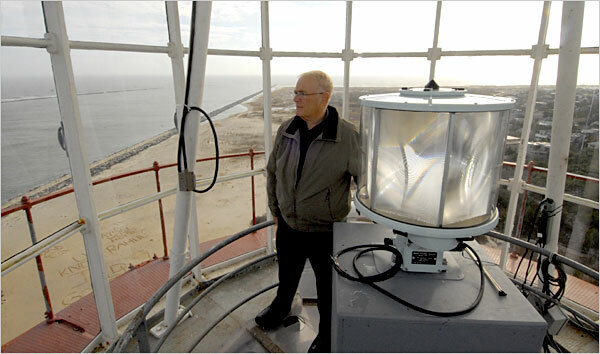 In recent years new lights have been developed and are now in use in lighthouses, for lighted buoys and for range lights. Some of these are l.e.d. lights. Others are not. One of the new type range lights or directional lights as they are now called was developed from of all things movie projector optical technology. It is an amazing light. This site is loaded with infomation about the new lights. And check out on this site the PEL lights and particularly the Osc light. Last edited by Grover1 on Mon Feb 02, 2009 3:25 am, edited 1 time in total. I very much perfer the First Order Fresnel compared to that present VRB-25. It appears from the number of bulls-eyes that the light displayed a regular or uniform flash pattern. It would be interesting to see what the differences are between the new lights such as ones being developed and Fresnel Lights. I would do this but I do not have the technical knowledge that may other people on this board do. The LEDs are brighter, last longer and consume far less power. I purchased a Brinkman LED flashlight about three years ago. I has four LED bulbs. It is still as bright as when new and with the two original D-cell batteries. The VRB-25s are great lights. However, USCG Ocean Engineering to reduce the cost of solarization reduced the output intensity of many installations. The lower current demand for both lights and fog signals reduced cost of solar panels and storage batteries. This diminished the effective range of lights and fog signals. The lens used with the 25s concentate the light beam to somwhat compensate for lower output, This caused a very bright false flash from reflection from the inside surface of the lanten glass. This was fixed by installing anti-reflection curtains within the lantern. These curtains worked but completely (and sadly) eliminated the distinctive loom of the traditional rotating light. the back side of the lantern from returning to the observer. Wow, a beautiful lighthouse. It seems to be a romantic.